Welcome to the “Five-Point Rescue Plan” website. We are a GP and Physiotherapist with Hypnotherapy N.L.P. CBT and psychotherapy qualifications which we use daily. Together we have over 40 years of clinical experience in helping people to overcome physical, emotional and psychological problems. We draw resilience tools and techniques from a vast array of sources and we are committed to passing them on in a practical accessible way. These real skills are available to all. Everyone must take responsibility for their own wellbeing. Resilience is key to this. People can learn to become more resilient using our resources. The Five-Point Rescue Plan is our unique resilience tool. It is a practical motivational framework that encourages strategic problem solving in any situation. It is just one of the many techniques we teach. We have wide ranging experience in leading workshops, group therapies and in one-to-one counselling. Learn about the various courses for individuals, health professionals and corporate or public sector workers that we run. If you have specific intended learning outcomes we can design a bespoke workshop for you. You can purchase our book ‘The Five-Point Rescue Plan’ below. What problem is dominating your life today? What is stopping you from moving forward? This book allows you to access the potential for change that lies within you. Using a step by step guide, we will show you how to identify and break down the issues at the heart of your distress. 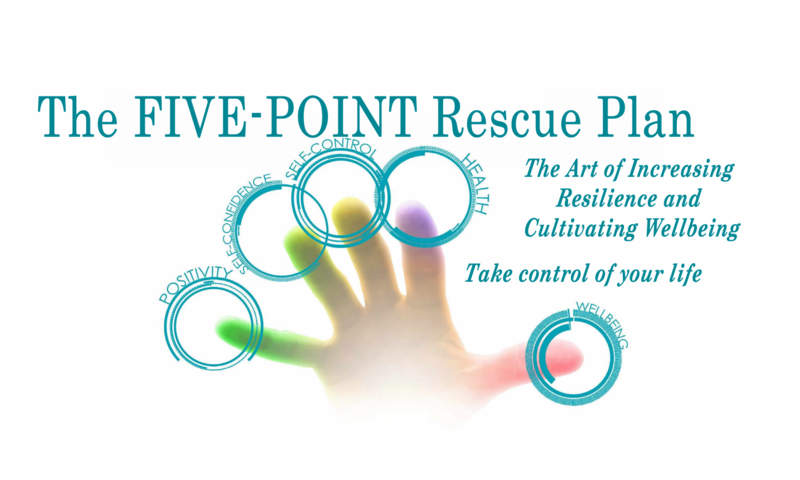 The Five-Point Rescue Plan helps you to formulate a simple strategy to manage your way through any problem. In writing this book, Christine Mowbray and Dr. Karen Forshaw, aim to give you the skills to work through your set of issues identifying which factors you can change and which you cannot. They will help you develop your own appropriate coping strategies. This will empower you and allow you to become independent of other people and of any emotional crutch. You owe yourself the best possible outcome of any situation and you can have it if you master the Five-Point Rescue Plan!